FORMSHIFT Feat. 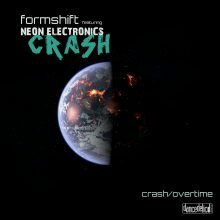 Neon Electronics "FORMSHIFT” is an alter ego of Gavin Bucktrout from Holland. At a young age Gavin got infected with Electronic music. Started playing vinyl records at the age of 13 and later under his alias D-Spirit he played at numerous parties and festivals since the year 2000. On his travel trough musical universe, FORMSHIFT ran into DIRK DA DAVO (ex The Neon Judgement), and also one of the beatmakers of the 'NEON ELECTRONICS' project. Dirk emidiately was impressed by FORMSHIFT's electro drones and it didn't take much time for DDD to co operate vocal wise! The result of this co-operation are 2 killer tracks that will be released the 25th of January 2016 through Dirk's label DanceDelicD.com: “CRASH” and “OVERTIME”. Fasten your seatbells and get into this wild groove!